This trance DJ had a special pair of phat pants that he always wore. The pants were over five years old when they started to come a part at the seams. They were worn down, battered, and abused - but the DJ loved them, and refused to throw them away. His friends asked him to, and he told them no way. His parents asked him to, and he said it couldn't be done. His girlfriend? She didnt even bother asking, she just snuck the pair out during the cover of night, and put them in the bin outside his flat. When he couldn't find them the next morning, they had a huge fight. She broke down and told him where they were. He rushed out and was ecstatic to find that his favorite pants were still in the garbage. He brought them back in and cleaned them up. 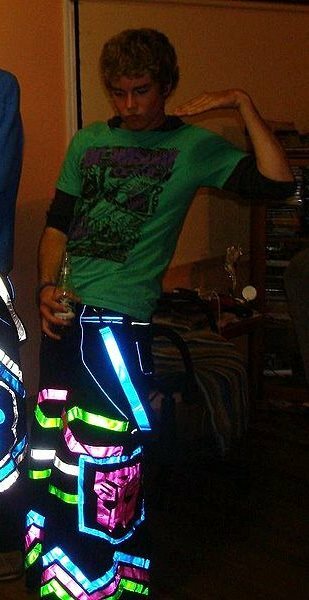 His girlfriend resigned herself to the fact that her boyfriend liked looking like a hobo raver. Little did she know, but those pants were going to play a mean prank on her boyfriend. He was going to regret ever taking them out of that garbage bin. Later that day, the DJ was on the metro, heading to school. He was wearing his favorite pants, of course. He put them on just to spite his girlfriend. He sat down in the metro and smiled to himself. Soon though, he noticed that people were staring at him in disgust. Several of them were backing away from him. He was confused by their actions, up until he looked down at his crotch and saw his balls hanging out. His pants had finally given up on life, and ripped open right where his crotch was. Our intrepid DJ had gone commando that day, so his family jewels had been on proud display for the whole world. Who knows how long his little show had gone on for. He left the metro at the next stop in an embarassed panic, and threw the pants out that very night. His girlfriend had a good laugh at his expense, and still brings it up - even today.